In 1944, Piaggio engineers Renzo Spolti and Vittorio Casini designed a motorcycle with bodywork fully enclosing the drivetrain and forming a tall splash guard at the front. In addition to the bodywork, the design included handlebar-mounted controls, forced air cooling, wheels of small diameter, and a tall central section that had to be straddled. Officially known as the MP5 ("Moto Piaggio no. 5"), the prototype was nicknamed "Paperino". Enrico Piaggio was displeased with the MP5, especially the tall central section. He contracted aeronautical engineer Corradino D'Ascanio, to redesign the scooter. D'Ascanio, who had earlier been consulted by Ferdinando Innocenti about scooter design and manufacture, made it immediately known that he hated motorcycles, believing them to be bulky, dirty, and unreliable. D'Ascanio's MP6 prototype had its engine mounted beside the rear wheel. The wheel was driven directly from the transmission, eliminating the drive chain and the oil and dirt associated with it. The prototype had a unit spar frame with stress-bearing steel outer panels. These changes allowed the MP6 to have a step-through design without a centre section like that of the MP5 Paperino. The MP6 design also included a single sided front suspension, interchangeable front and rear wheels mounted on stub axles, and a spare wheel. Other features of the MP6 were similar to those on the Paperino, including the handlebar-mounted controls and the enclosed bodywork with the tall front splash guard. 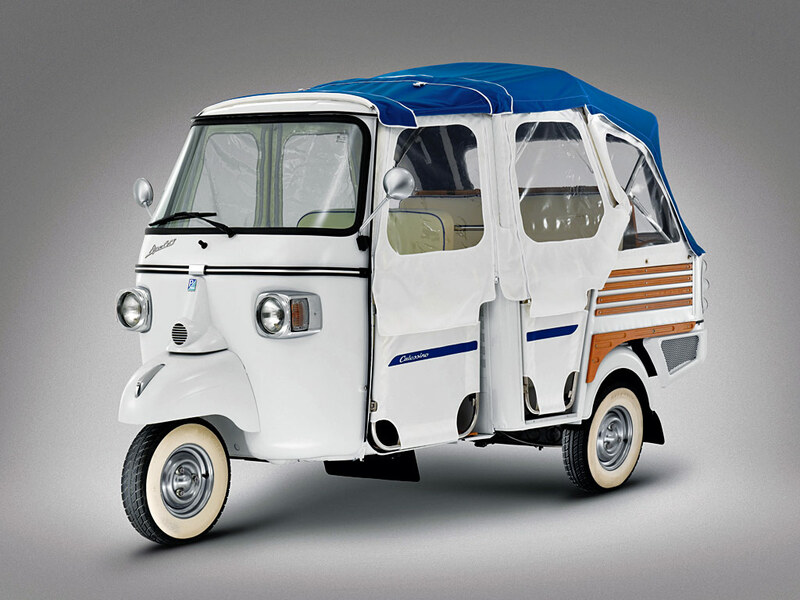 Upon seeing the MP6 for the first time Enrico Piaggio exclaimed: "Sembra una vespa!" ("It resembles a wasp!") Piaggio effectively named his new scooter on the spot. Vespa is both Latin and Italian for wasp—derived from the vehicle's body shape: the thicker rear part connected to the front part by a narrow waist, and the steering rod resembled antennae. The name also refers to the high-pitched noise of the two-stroke engine. The basic patented design allowed a series of features to be deployed on the spar-frame which would later allow quick development of new models. 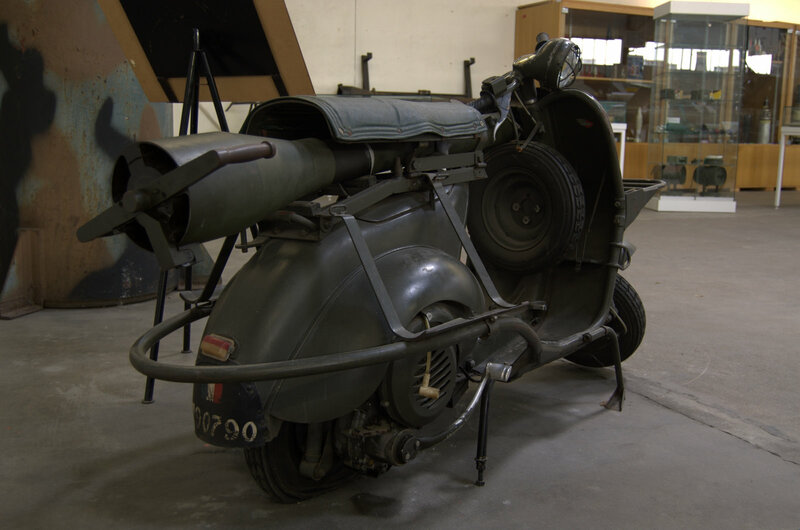 The original Vespa featured a rear pillion seat for a passenger, or optionally a storage compartment. The original front protection "shield" was a flat piece of aero metal; later this developed in to a twin skin to allow additional storage behind the front shield, similar to the glove compartment in a car. The fuel cap was located underneath the (hinged) seat, which saved the cost of an additional lock on the fuel cap or need for additional metal work on the smooth skin. The scooter had rigid rear suspension and small 8-inch (200 mm) wheels that allowed a compact design and plenty of room for the rider's legs. 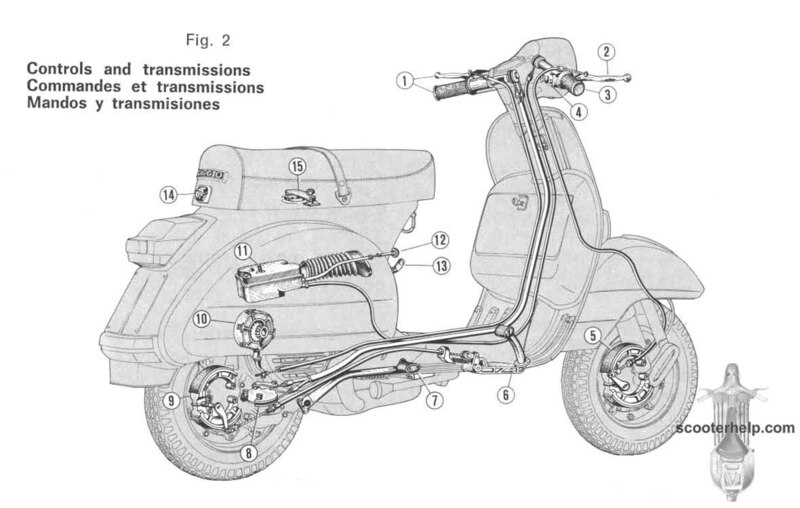 The Vespa's enclosed, horizontally-mounted two-stroke 98 cc engine acted directly on the rear drive wheel through a three-speed transmission. The twistgrip-controlled gear change involved a system of rods. The early engine had no cooling, but fan blades were soon attached to the flywheel (otherwise known as the magneto, which houses the points and generates electricity for the bike and for the engine's spark) to push air over the cylinder's cooling fins. The modern Vespa engine is still cooled this way. The mixture of two-stroke oil in the fuel produced high amounts of smoke, and the engine made a high buzzing sound like a wasp. The MP6 prototype had large grilles on the front and rear of the rear fender covering the engine. This was done to allow air in to cool the engine, as the prototype did not have fan cooling. 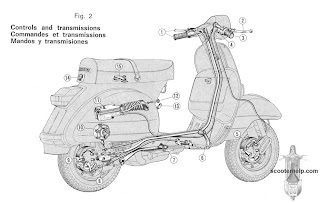 A cooling fan similar to that used on the MP5 "Paperino" prototype was included in the design of the production Vespa, and the grilles were removed from the fender.